In Tony Cade Bambara’s The Salt Eaters, healer Minnie Ransom attempts to perform a spiritual cleansing, the “healing” of the novel, on community activist, Velma Henry. As she initiates the healing, Minnie speaks the words above to Velma, ensuring that Velma realizes that the healing is not a cure-all. It entails not only wellness but also the strength to take on accountability for self and others, responsibilities that may span generations and which necessarily rely on ancestral/spirit knowledge for its maintenance. At once personal and individual, the healing is thus as much communal as it is personally all encompassing. The healing of one is at once the healing of multitudes across time and space. Who would not want that? The concept of “lave tet” in Haitian vodou is one associated with the ritual of initiation into a vodou society or lakou/yard. It literally means “washing of the head” and traditionally entails cleansing the head of the initiate with a water bath infused with a variety of elements including sacred and medicinal leaves, flowers and other items commonly used in sacred ceremonies. Resembling a baptism, the point of the lave tet is to bind the initiate to the group, to cleanse him or her of wrong or clouded spiritual thinking, and to make him or her open to the spirits for future “monte chwal,” mounting by the lwas/gods. It is a means of and for purification and provides a door to proper communication with the spirits. But is it always necessary to be or to become an initiate of vodou in order to receive such purification, to be open to spirit? I have come to believe that the answer to this question is a simple ‘no’ for reasons implicit to vodou and implicit in Bambara’s character’s entreaty, “so’s you’re sure…and ready to be healed?” (10). The rest of Beaubrun’s text serves, then, to indirectly “initiate” the reader to this new form of lave tet, an emptying of the self in order to access ancient knowledge. For Beaubrun, this “emptying” takes place through dream work and self-examination, and also through a skeptical redress regarding the assumption that academic training provides all the answers; but, it is also clear that the text gestures to there being many possible forms of lave tet. There are most likely as many ways of emptying the self and finding one’s way to source then there are kinds of people in the world. How can we perform lave tet? What does it mean to do so? What would it mean to commit to self-emptying, to healing work that cleanses the self and participates in (spiritual) community building, both past and present, and what could or should this process have to do with life in academia? In a brief visit April 2013 to a children’s Afro-dance school named Kalalú, founded and led by Dominican dancer Marily Gallardo, I found myself leaning in to listen carefully to Gallardo’s reply to a question regarding why she had founded her school. My recollection of what she said, in Spanish, loosely translated and paraphrased here, is as follows: “I’m aware that most of you are academics,” she said, “and so I am going to tell you the question I asked myself: ‘Do you want to be contaminated by the system, or do you want to break with the system?’ I chose to break with the system.” In the school, Gallardo teaches all kinds of African-based dances, including traditional dances from Haiti, from across the border. She does so in order to restore the children’s sense of ancestry, heritage, and to build their self-esteem in a country, at the level of the state and in social relations, that systematically devalues African heritage. In the United States, as in the Dominican Republic, a systemic undermining of African-based knowledge and culture also permeates higher education and social/political relations (this has become blatantly apparent during President Obama’s administrations). The questions we then have to ask ourselves may be: How do we combat this devaluation? How do we prevent a desire to succeed to cloud our judgment and warp our relationships to others in the struggle? How do we participate in resistance movements without only becoming appendages to the institutions that must produce it? Though not all of us may have the means to leave the institutions (academic or other) that have contributed to making us aware of the endemic undervaluation of African-descended cultures and people, we can do something about the “contamination” to which Gallardo alludes. I would suggest that we can circumvent it by performing symbolic forms of lave tet. 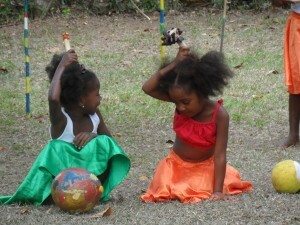 Doing so does not require becoming an initiate in a vodou society and it does not even require that one be of African descent (indeed, the purpose of lave tet transcends cultural barriers even as it belongs specifically to the Haitian tradition and is shared with other African-descended spiritualities). What it requires is an investigation of what we carry in our hearts and mind and choosing to cleanse these of traces of self-loathing, ego, envy, condemnation and, even, dislike or resentment of others who may have produced strife; it then requires that we replace such thought formations with love and understanding of the past, of the ways of our ancestors, appreciation for ourselves and for others, even when we/they fall short. A lave tet means that we commit to healing and to being open to the pains of life and of history while being committed to reducing pain in the world, to heal what we can in ourselves and for others. It also means that we commit to understanding that our own wellness serves as a guide for others. We have, then, to commit to a practice of wellness in order to be able to work, at a soul-level, with others, in order to heal the pains of the past, and, as hackneyed as it may sound, to save the world. Doing so will re-orient us in cultures and institutions that do not and cannot love us. Only we can love ourselves. A lave tet can come in many forms: in the traditional head-cleansing of the vodou ritual; through the mystical laying of hands; symbolically and metaphorically. Lave tet liberates us to become better versions of ourselves to fulfill our paths, to honor the ancestors from whom such knowledge comes, to honor the struggle of spirit each of us is born to and must, alone, pursue. By practicing whatever form of lave tet that rings true to our own lives, we stand a better chance to successfully move from lave tet, to met tet ansamn – to putting our heads together – to walk together on the challenging path of healing, spiritual, problem-solving work to solve real-world problems that often originate in the absence of spirit. Why would we not want this? Because a lave tet is not a cure and not an end: it is only a beginning, an awakening to life-long practice. It is work. It is love. This, of course, is just such a beginning. Bambara, Toni Cade. The Salt Eaters. NY: Vintage, 1992. Elements will vary according to the group practice and can also, at times, be improvised. Apartheid in the Americas: Are you Haitian?